Designing an all-terrain robot for search-and-rescue missions is an arduous task for scientists. The machine must be flexible enough to move over uneven surfaces, yet not so big that it’s restricted from tight spaces. It might also be required to climb slopes of varying inclines. Existing robots can do many of these things, but the majority require large amounts of energy and are prone to overheating. Georgia Tech researchers have designed a new machine by studying the locomotion of a certain type of flexible, efficient animal. “By using their scales to control frictional properties, snakes are able to move large distances while exerting very little energy,” said Hamid Marvi, a Mechanical Engineering Ph.D. candidate at Georgia Tech. Marvi’s advisor is David Hu, an assistant professor in the Schools of Mechanical Engineering and Biology. Hu and his research team are primarily focused on animal locomotion. They’ve studied how dogs and other animals shake water off their bodies and how mosquitos fly through rainstorms. This isn’t the first time Hu’s lab has looked at snake locomotion. 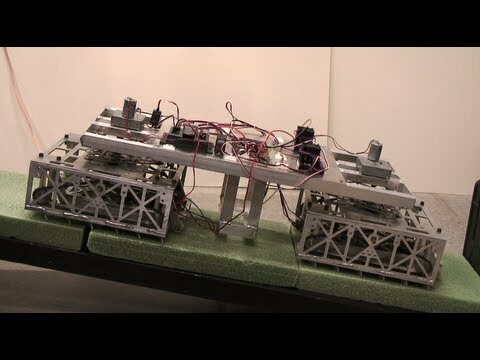 Last summer the team developed Scalybot 1, a two-link climbing robot that replicates concertina locomotion. The push-and-pull, accordion-style movement features alternating scale activity.